As we witness the devastation in Texas it's natural to ask, "How can I help?" The community has been asking the same question and wondering if the Chamber has plans to assist. The situation in Texas is a dynamic one and needs are changing day to day. We have determined the best way to help at this point is by assisting area businesses and organizations in spreading the word about their efforts. Our local churches and many area businesses have direct connections with organizations in the areas affected, making offering assistance more efficient. As local relief efforts come to our attention we'll be making updates to this listing, so please, check back often and share this page with your family members, friends and neighbors. ** If your business, church or organization is conducting a relief effort for those affected by Harvey, or you know of such an effort in the area, please let us know by emailing us here. We will be updating this list and helping to spread the word to the community through this website and our social media channels. 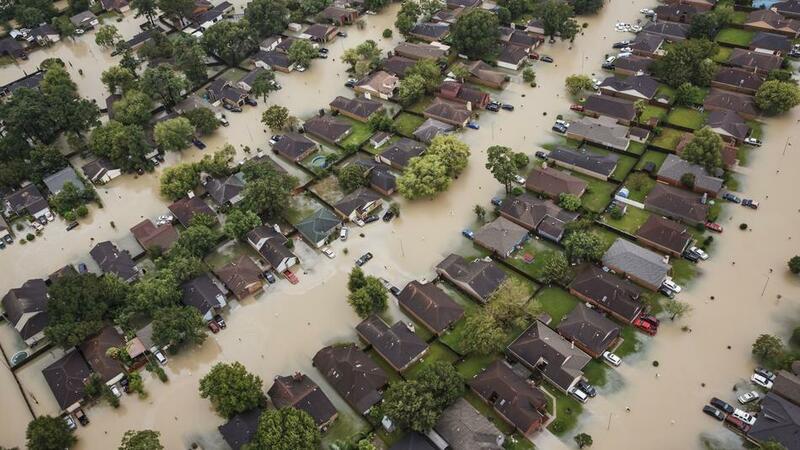 CrossRoad Community Church: Monetary donations are being collected through September 13 to help the church families at Grace Church in Humble, TX (a Houston suburb). The four campuses of Grace Church have been serving as shelters and many of the church's families have been impacted by the flooding. A majority do not have flood insurance. 100% of your donation will be sent to Grace Church and 100% of what is sent will go to assist those in need rebuild. In addition, a construction convoy is being planned to spend two weeks with the families of Grace Church who have been affected, assisting with demolition and repairs to their flooded homes. Find more details on their website here or call Angel at 715-273-3678. English Lutheran Church: The Ellsworth English Lutheran Church is partnering with Lutheran Disaster Response to assist with long term recovery efforts in the aftermath of Hurricane Harvey. Lutheran Disaster Response's affiliate organization is actively present in the impacted communities, collaborating with local officials to initiate the proper response, particularly needs essential for long term recovery. Gifts to Lutheran Disaster Response will be used entirely (100%) for this disaster. More information can be found on their website here. To make a financial donation, contact the English Lutheran Church at 715-273-4617. Ellsworth Lion's Club: Lion's Club International, through their Foundation (LCIF), is responding to the Hurricane Harvey disaster with an emergency catastrophe grant in the amount of $100,000. The grant will allow Lions in the area of impact to provide life-saving supplies of food, water, blankets and other necessities. You can contribute to the Foundation to ensure that when or where disaster strikes, LCIF's emergency and major catastrophe grants will be available enable local Lions to respond, making an immediate impact in the hardest hit areas. To learn more or make a donation visit their website here. Sheriffs Adopting Sheriffs: The Pierce County Sheriff’s Office is joining forces with the Badger State Sheriffs’ Association and Wisconsin’s 72 Sheriff's Offices to assist Sheriff's employees in Texas who worked to provide lifesaving assistance to area residents while their individual family and property suffered a major loss. The goal is to raise $10,000 by October 1. Every dollar raised will go directly to these Texas law enforcement families. Find more information here or contact the Pierce County Sheriff's Office at 715-273-5051. COMPLETED St. Francis Church: Monetary donations will be taken up as a second collection at all masses the weekend of September 2-3, 2017. Funds will go to Catholic Charities USA whose rapid response teams are being sent into the areas most impacted by Hurricane Harvey. They will provide coordination and short-term and long-term recovery services in collaboration with other area Disaster Relief agencies, and by working with the Mayor’s office on their disaster recovery plan. This means first meeting emergency needs such as shelter, food, and medication assistance for those who have lost everything. Masses will take place on Saturday, September 2, at 5:00pm, and Sunday, September 3, at 8:30am and 10:30am. Checks (Marked Harvey Relief Effort) can also be sent to St. Francis Church, 231 Woodworth Street, Ellsworth, WI 54011. For more information call 715-273-4774. St. Paul's UCC: UCC Disaster Ministries is gearing up for long-term recovery work in the Houston area. Your contributions for Harvey survivors means providing community support for holistic recovery, repairing homes for families, and restoring dignity for the most vulnerable who have lost everything in the wake of this catastrophic event. 100% of funds designated for disaster relief are used for disaster relief and rehabilitation programing. To make a financial donation, send your check (marked for "Hurricane Harvey/UCC Wider Church Ministries") to St. Paul's United Church of Christ, W5706 WI-72, Ellsworth, WI 54011. For questions or more information, contact Rev. Westrich at 715-273-3118. Zion Covenant Church: Zion Covenant Church in concert with the Mid-South Conference of the Evangelical Covenant Church and Covenant World Relief are working to meet immediate needs along the Gulf Coast in the wake of Hurricane Harvey. Your generous gift will enable the church to continue their response as long-term recovery efforts are launched. For more information or to make a donation, visit their website here.